This darling boy is eight years old! With an even birthday, it was his year for a party. He wanted to go to Jump Street ... but the cost was prohibitive. 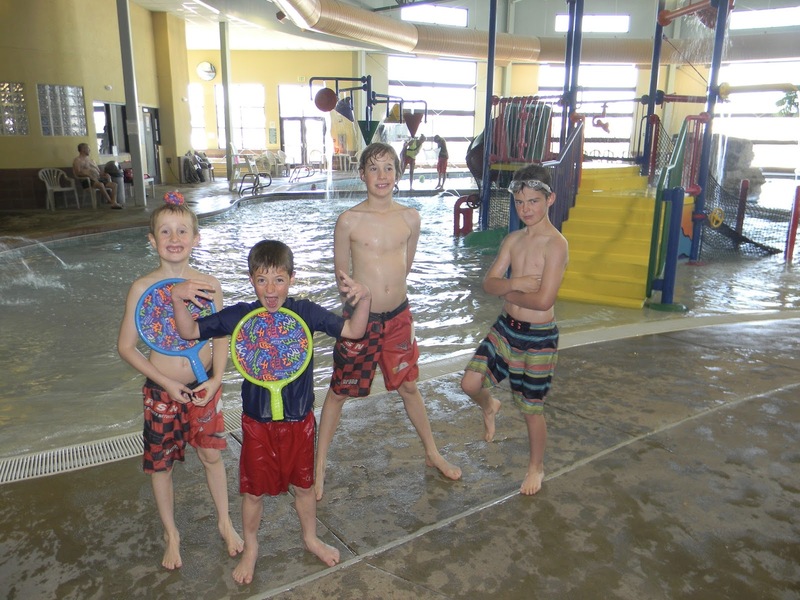 So, we decided to go to the Castle Rock Rec Center swimming pool. And who did he want to have at his party? The Davidson kids!!! Wesley, Kezi, Noel, and Calvin - one buddy for each of our kids. It turned out that Daniel Hernandez's birthday party got rescheduled for May 1st at the MAC in Castle Rock. So, we made 2 days of it ... a small celebration with Richie, Poppi, and Aunt Shawn, followed by going to the MAC Sunday afternoon, sleeping over at mom and dad's Sunday night. 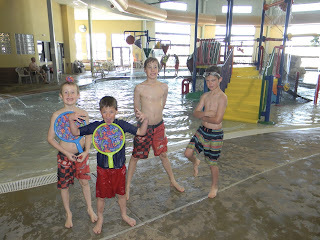 Monday morning, we went to the Stucky's for breakfast ... then to the Rec Center to swim! It was a beautiful day and the kids got to play on the playground after lunch. After running a few errands ... we got home about 7:30pm and made macaroni and cheese for Sawyer's birthday dinner and opened presents. On Monday, he awoke to streamers and his birthday table decorations ... and we had cake after pizza dinner. He got lots of Star Wars toys. And of course, he got $16 ($8 from each set of grandparents) and now he can shop! It was a pretty good birthday. Sawyer is such a sweet boy. He's still little enough that I can carry him. He's a smart little guy and does incredibly well at school. He loves to play with Liberty when the Bigs are schooling. He loves baseball - and can often be found in the yard playing with Landon. He like to ride his bike and scooter. He gives good hugs and gives me kisses, even if to no one else. It's hard to believe that it's been eight years since we were living in Albuquerque (one of the most difficult seasons of my life). Steve was going to school and working at Starbucks. Sawyer was 2 weeks overdue, which seemed like an eternity at the time. 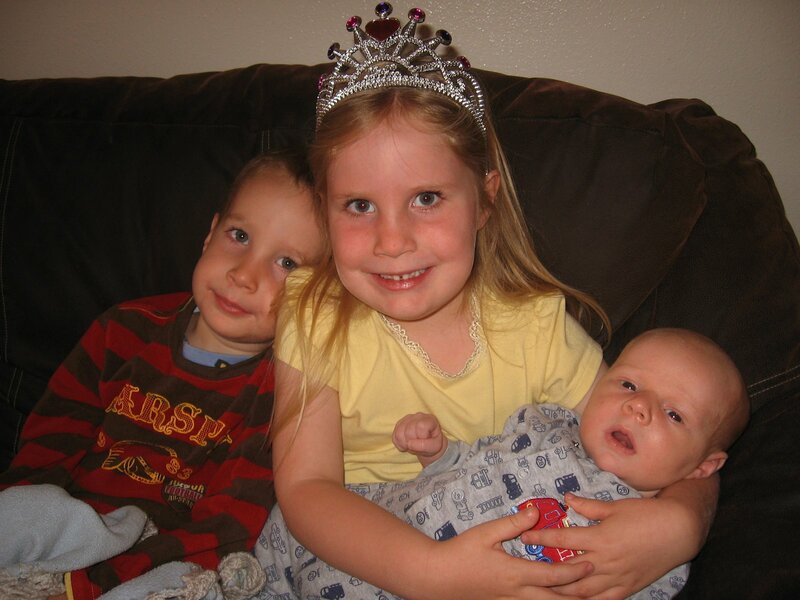 Shiloh was almost 5 and Landon was 3 1/2. Sawyer has always been our Albuquerque blessing, amidst the most difficult 15 months I was facing. We couldn't be more proud to call this young man our son.